HARTFORD – Who has the right to write history? Those who have lived it and remember? Those who study and protect it? Or, those who would seek to distort its very existence? And, finally, what is all our responsibility once we know the truth? These are the difficult questions posed by Jeff Cohen’s intriguing and powerful play, “The Soap Myth,” that focuses on the widely held belief that the Nazis made soap using the body fat of Jewish corpses. Written by playwright Jeff Cohen, “The Soap Myth” debuted a decade ago Off-Off-Broadway. 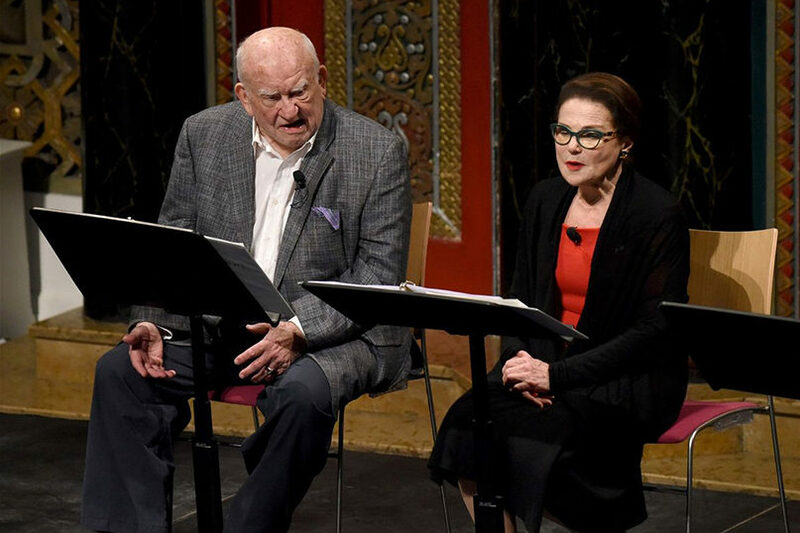 It has now returned with a short national tour starring the acclaimed actors Ed Asner and Tovah Feldshuh, that is performed in concert style: there is no set, and the actors sit in place and have scripts in front of them. Among its 12 performances, “The Soap Myth” will be presented by Voices of Hope and the Mandell JCC at the JCC on Wednesday, April 24 at 7 p.m. In addition,filmed version of the play will be presented as part of the Bridgeport Yom Hashoah Commemoration sponsored by UJA/Federation of Westport, Weston, Wilton & Norwalk and UJA/Federation of Eastern Fairfield County, and held on Sunday, April 27, 8:15 p.m. at Congregation B’nai Israel. A prolific writer, in addition to “The Soap Myth” Cohen has written several books and plays, including his two new plays: Righteous, about a “righteous gentile” who warned the world about the Final Solution in August 1942, and Squeaky, a sequel to his book Men of Clay about end-of-life events with his father Stan “Squeaky” Cohen. He is also founder and artistic director of three Off-Broadway theaters – the RAPP Arts Center, the Worth Street Theater Company/Tribeca Playhouse, and Dog Run Rep.
Cohen is best known for his signature theatrical event responding to the Attacks of 9/11, The Tribeca Playhouse Stage Door Canteen – a 10-week USO-style variety show to “entertain the troops” (the rescue and recovery workers at Ground Zero) that featured such stars as Kristin Chenoweth, Phylicia Rashad and Colin Quinn, which received a special 2002 Drama Desk Award. 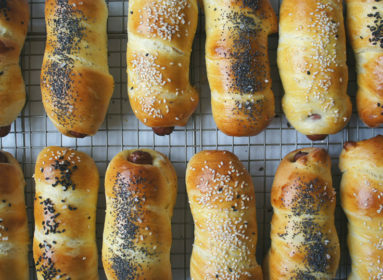 JEWISH LEDGER (JL): Talk about your Jewish background growing up. Do you have a personal connection to the Holocaust through family? JEFF COHEN (JC): My grandparents came over from Russia in the early 1900s, so I don’t really have any personal family connection with the Holocaust. I grew up in Baltimore and my parents were divorced. On my mother’s side there was really very little of religion at all. But my Bubbe [paternal grandmother] would celebrate Shabbos every Friday night and have the family over. It was more of a tradition than it was highly religious. I myself am not “religious” except on the High Holy Days. I was bar mitzvahed but never went to Hebrew school. I learned the Haftorah transliterated. And I went to a Friends school in Baltimore. So, I kind of had a mixture of a Jewish upbringing and a Quaker education. It’s kind of a hodgepodge. JL: Which makes it even more interesting that you were drawn to write this play. How did that come about? JC: I have a small theater in downtown in Tribeca and sometime around 2002 an elderly gentleman named Morris Spitzer came up to me after a performance and handed me a little envelope and he said, “maybe there is something you can do with this.” That was the first time I had ever met him. Inside the envelope was a Moment magazine article called “Slippery History,” which was about Morris. He was a Holocaust survivor and he was on this crusade about [the bodies of Holocaust victims being turned into] soap. In the article there were various scholars saying one thing and the survivors saying another. That was how I was introduced to the subject. It was something I had never encountered before and I felt that this could be really be interesting but didn’t know how to dramatize it. And so it took about seven years before I finished a draft of the play. We did a workshop of it in South Street Seaport in the theater space I was working out of and as soon as I saw that draft in front of an audience I knew I had gotten a lot of it wrong. So I rewrote the whole thing from page one. That was the first version I sent to Arnold Mittleman, who was the producer of the Coconut Grove Playhouse in Florida for many decades and producing artistic director of the National Jewish Theater Company, and he was very interested in the play. JL: Getting Ed Asner to play the Holocaust survivor seems like a real coup. Was he involved from the beginning? JC: No. The play was originally produced and directed by Arnold Mittleman at the Roundabout Black Box in 2012. Then a couple of years later we had an offer from the Lincoln Center Library for the Performing Arts to do a reading there and I decided that I would try to get in touch with the man for whom I had originally written the part – that was Ed Asner. He is the embodiment of that character. I was really fortunate to be able to speak to his agent and then get in touch with his daughter. I got him the script and he read it. We flew him out to New York and he basically did a cold reading without any rehearsal at the library. He was wonderful. JL: What about Morris Spitzer – was he at all involved in the writing or production of the play? JC: I never saw him again. JL: You don’t know if he’s seen it? JC: It’s a funny story. [A while back], I googled him and there was an obituary for a Morris Spitzer in New Jersey. I just assumed that was him. Then, when we were doing the Broadway production in the Roundabout, a woman came up to me after the performance and said, “That’s about Morris Spritzer.” I said, “Yes, it is.” And she said, “I was his longtime girlfriend and companion.” She told me he was still alive but, sadly, he was suffering from severe from dementia and living with his son in Michigan. I actually got in touch with them and they put him on the phone. It was so sad – he didn’t remember anything. JL: Did you have trouble getting this staged? Does the subject matter draw in all kinds of audiences – Jewish and non-Jewish? JC: Theater is a funny business. It’s very hard to know what will be audience-popular or not, so I try not to think of those things. What really happened with this was Ed Asner. I think many will agree, Ed Asner is one of the great American actors of all times. At 90 years of age, he has a place in the pantheon of great American actors. To watch him as a deeply sad Holocaust survivor is extraordinary. So, of course, Ed lending his name to a project like this changes the calculation. Because I have Ed Asner, I am able to get Tovah Felshuh or I’m able to get Jayne Atkinson. I’m able to pitch this and get the interest of synagogues and Jewish centers and huge performing arts centers. So one of the great gifts that Ed has given to me and this play is that it has allowed audiences that never would have had the opportunity to see it and see him, and it’s been a really great gift. JL: I read the script and I switched back and forth between being sympathetic with the Holocaust survivor but then understanding the dilemma faced by the historian and the museum. Have you gauged the audience’s reaction to the dilemma posted? JC: Let’s begin with your reaction. Your reaction is really a bull’s-eye reaction of what I was trying to do with the play. In other words, the idea of this tension between survivor and scholar is a really important one. The [internationally recognized Holocaust] scholar Michael Berenbaum has become one of the great champions of the play, and one of the reasons is because for him it really does encapsulate that tension. We do a talk back after the show with the audience and very often audience members want to know did they make soap or didn’t they make soap? I try to tell people that whether or not they made soap or how much soap they made is irrelevant. What’s really important is that you have this survivor who lives through it and who has this sort of toxic memory inside of him. He has to be honored and he has to be listened to. He is the history. Whether or not his memory is wrong is irrelevant. Unfortunately, all of the survivors will soon be gone. One of the things that I love most about live theater is that whenever an actor plays the part of [the survivor] Milton Saltzman on stage, for those 90 minutes Milton is alive. There’s an immortality to that. Two weeks from now in Hartford, five years from now, 100 years from now…as long as an actor plays that role for that period of time, that character lives. I believe very strongly that Elie Weisel’s admonition “Never Forget” is fading, and as long as Milton Saltzman is alive he will not let people forget. JL: Is that your central message: that these survivors need to be heard and respected? JC: I think the central message – if I were to reduce it to a central message – is really more about the denial of what happened. As you get further away from the 1940s, the Holocaust becomes merely an asterisk in the history books. That people who are not Jewish do not have a personal familial stake in what happened. People are going to forget. And so as a playwright my message is – and I don’t care if it’s my play or [something else] – it’s up to all of us to keep that torch lit so that people don’t forget and so it doesn’t get repeated. One of the terrible lessons that the Nazis taught us – taught the world – about the Holocaust is that genocide is possible. I believe that every genocide or attempted genocide since then has used the Holocaust as their blueprint. And so we really vigorously have to work against that. I give Milton a speech at the end of the play in which he describes the times – and this is true – when the Nazis would actually let the prisoners bathe in the shower. And there’s the moment when they are bathing and they are not being gassed and therefore they are joyful. Then, the guards tell them that the soap isn’t pure, that it is made from their relatives. Well, I certainly believe that happened, but it doesn’t need to be factual that the soap was made from human fat. The fact that it was just a way to screw with these concentration camp inmates shows a cruelty that goes beyond the actual fact. When people ask me what do I think happened, well, I think there is enough testimony to say that there were special experiments, that was proven at Nuremberg. But the idea that you could take something as everyday as soap – something that we use every day to clean ourselves – and to turn that into something so horrible…well, it just speaks to the human capacity for the worst kind of cruel behavior. Ticket information for the Mandell JCC April 24 performance: (860) 236-4571. Admission to the Bridgeport Holocaust Commemoration is free. ADVERTISE WITH US! Contact Leslie Iarusso Join Our Weekly Email List!